Given some of the more perplexing precedents, I can understand why bashing local politicians seems to be our national pastime. Those hilarious classic Youtube videos of former Carpentersville Mayor Bill Sarto trying to run a city council meeting immediately come to mind. But the truth is, far more often than not, it’s actually our local reps who spend untold thankless hours faithfully serving the folks who put them in office while those very same constituents always manage to give me another migraine headache. Doubt me? Here are three perfect examples of what I speak. Though that body overruled the Historic Preservation Committee 8 to 1 in granting the County permission to demolish the old Sixth Street school building, it wasn’t before a parade of residents got up to say some of the most absurd things I’ve ever heard. Please don’t get me wrong, I love it when a concerned citizen gets up to plead their case, but the secret to success is not to simply spout whatever managed to pop up in your mind yesterday. One woman compared their effort to saving the downtown Geneva Pure Oil building, but apples and oranges aren’t the same thing. One building is ten times the size of the other. A plurality of other residents believed that, despite the rehab cost being at least twice the building’s value, an 11th hour white knight developer would somehow swoop in and take a flyer on it. Never mind that no one’s made any such inquiry in the last 20 years and if they had, they’d want to tear the old school down too. One gentleman didn’t want to have to look at the resulting “prairie” which puts him directly into a minority of one, while others thought the building could be retrofitted to be a library despite asbestos, a weak floor load capacity, and an HVAC system that’s more temperamental than Mayor Burns. The wildly inconsistent and very disappointing Alderman Dean Kilburg didn’t help matters any by consistently chiding the County for their failure to maintain the building. Perhaps if former Chairman Karen McConnaughay were in attendance he would’ve had a point, but the current Chairman’s only been in office for just two short years. Only one Geneva resident had the intelligence and foresight to get it right when he postulated that an unsellable and soon to be unmaintained building would be far worse than simply demolishing it. You sir, should run for office. Led by a mattress salesman with delusions of grandeur, this group does their damndest to undermine any positive downtown Elgin effort. Their motto is, “Unless we thought of it, it can’t possibly be good.” And none of their thoughts are very good. They attack the City Council, they attack the vastly improved Elgin Police Department, and they attack anyone who dares speak out against any of their unofficial members. Their insistent whining and bullying tactics have gotten so bad that it’s starting to have a negative effect on a generally rebounding downtown. It’s not that they have any power, but they can make a new business’s life completely miserable. The problem is, unlike you and I, local governing bodies can’t choose to ignore any of their constituents so this cabal gets their stilted say at every turn. Then they promptly proceed to waste everyone’s time. And, trust me, there is no force in the Universe that could possibly pierce their perceived veil of infallibility. This group is the worst of all and that’s really saying something when you consider our previous example. 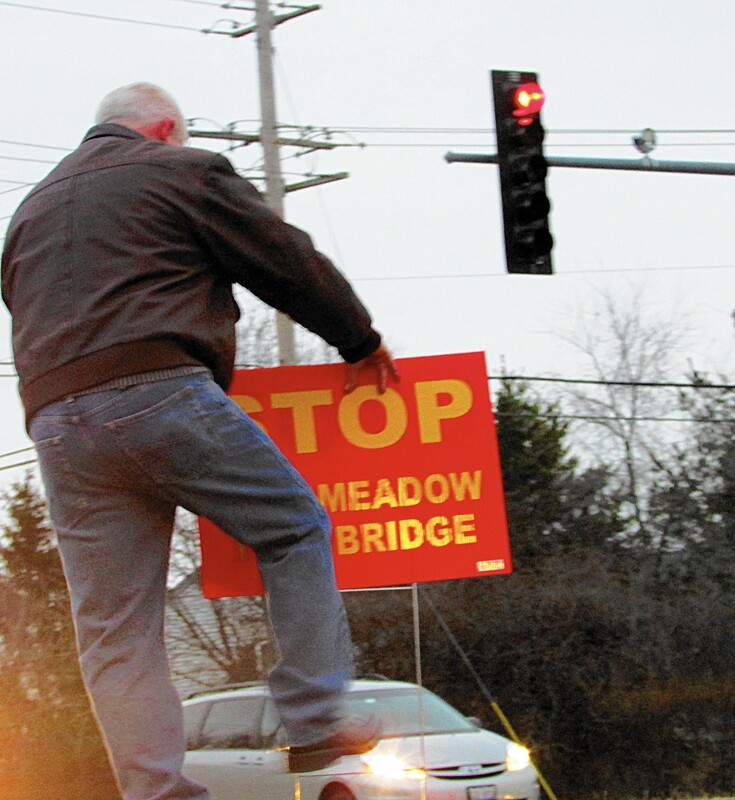 A mere twenty years too late, and blaming everyone but themselves for their absurd brand of obliviousness, their goal is to derail the Longmeadow Parkway project that’s been signed off on by 10 municipalities and is already well into phase two. They have absolutely no chance of accomplishing that goal, but that doesn’t mean they won’t do their best to make every politicians’ life miserable along the rest of the way. I’ve already run into them once and they’re so rude, obnoxious, and loud that they actually make me look good. But because a press release simply fell into the Courier-News’ lap (God forbid that paper should actually make an effort), insipid reporter Gloria Casas referred to this group of ten as a “groundswell” and County Board member Phil Lewis, who’s never been the brightest bulb in the pack, made matters so much worse by actually attending one of their gatherings. I realize I’m being a bit harsh here, but not only am I really good at it, but sometimes it’s the only way you can get through to “regular folks.” Why expend all that time and energy only to be shot down because you’re so utterly ineffective. All I can say is, the older I get the more I realize I’d rather hang with the politicians. ← This is the March 23, 2015 edition of Left Right and You! snotty and imperious methods of extorting anything they want from Geneva’ s lame City Council. Is there a group like this in EVERY city? Dear Observer, Sadly, there pretty much is!